In the previous article, we developed the utility for sorting out and selecting symbols with an appropriate entry point. We learned how to sort out symbols by various parameters, as well as navigate through symbols using specially designed buttons. However, the picture is not so rosy in terms of symbol selection. Currently, we have to write the tickers of the selected instruments on a piece of paper, which has a very negative impact on the planet's forest populations. In this article, we will save trees from destruction and will learn how to automatically save graphical objects created on a chart so that you do not have to constantly create them in the future. First, let's simplify porting the utility to the MQL4 language. In the previous article, we replaced one code block with another to let the program work in MQL4. Now we face a more difficult task. We can either carry out development in a single language, for example, MQL5, and then constantly replace blocks of code not working in MQL4 with the necessary ones, or we can simultaneously develop two programs: in MQL5 and MQL4. Neither option is optimal. We should either constantly replace the blocks (in each version) not working in MQL4, or keep in mind the parts of the code we changed to implement that changes into the utility in another language. Further in the article, we will immediately port code blocks that do not work in MQL4 using this construction. To save the Earth's forests, we will create three tabs that are to display only the previously selected symbols. Let's name these tabs Long, Short and Range. Of course, you do not have to add solely upward, downward or flat symbols there. You can use them at your discretion. As a result, the chart our utility is launched at features yet another row consisting of four buttons: the All button and the three previously described ones. Thus, the objective has been set. Now we have to implement it. To do this, we will have to re-write a small part of our utility. Auxiliary variables. Another change concerns the panel1val variable. We have changed its name to panelval. This is a purely cosmetic amendment but it should be noted. The cur_panel parameter containing the index of the currently active tab has also been added. The variable type is uchar. This means it may take values from 0 to 255, which is quite enough, because we have only 4 tabs. Other changes. Listing all implemented changes is unnecessary since many of them are too insignificant. So let's move on to the main changes now. As for small changes, you can detect them on your own by comparing the source code of the new utility with the one attached to the previous article. The main changes are mainly the ones related to displaying our new tabs. We decided to work with our tabs in a loop. Let's see how we are going to do that. // define the maximum possible x axis coordinate for displaying tabs. // move to the new line. We will call the function in the start_symbols function before calling the show_symbols function displaying the symbol buttons. Buttons for adding symbols to tabs. Now we need to add symbols to a selected tab. 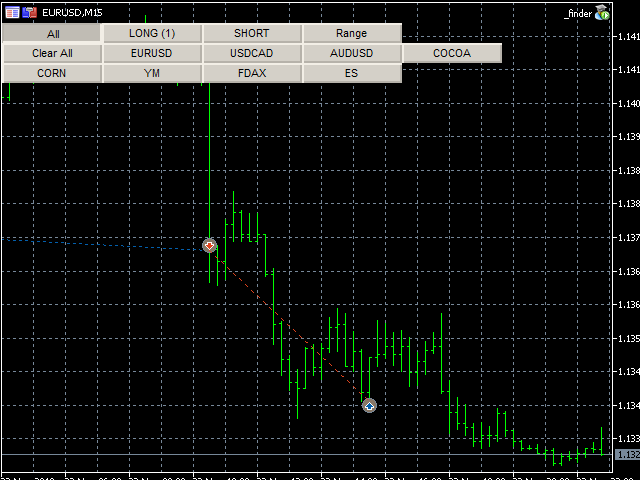 We will do this with the help of new buttons Add LONG, Add SHORT and Add Range on the open chart page. If you remember, in the last article, we implemented the ability to click on the desired symbol button. After clicking on a symbol, a chart is opened containing the buttons block for navigating through the entire symbol list in the lower left corner. We will add our buttons to this block. Depending on whether this symbol is in the corresponding tab, the button will either add it to the tab or delete it from there. Saving tabs contents between the utility launches. What if we accidentally close the EA? Then all our efforts will be wasted. Should we start adding everything again? Let's make sure that symbol lists we add to the homework tabs are saved to the file and restored upon further opening. If you trade in different markets, you will have to constantly tune the utility when switching from one market to another. After all, if you are currently going to trade the American stock market waiting for a breakthrough in the first hour and a half after the market opening, then you do not need shares of the European or Russian market, which have opened long time ago. Similarly, if you are trading in the Russian market, you do not need US stocks. In order not to be distracted and focus solely on the necessary symbols, it would be reasonable to create separate sets of parameters for markets of different countries, as well as for the Forex market, and upload each of set files when it is necessary. This is quite simple and takes seconds of time. However, it is difficult to understand what settings are uploaded at the moment. In addition to identifying the current set of parameters, the cmt input helps us separate the symbol lists in the homework tabs. After all, if we add the symbol to a homework tab for working on a US market, we do not need that symbol when working in the Russian stock market. Set files having different sets of parameters should also feature separate lists for the homework tabs. Another issue we need to solve to work with charts is auto saving and restoring graphical objects we created on the chart. If we set a level on the chart, we expect to see it again after closing the chart window and re-opening it. We surely do not want to place dozens of levels every time we open a symbol chart. 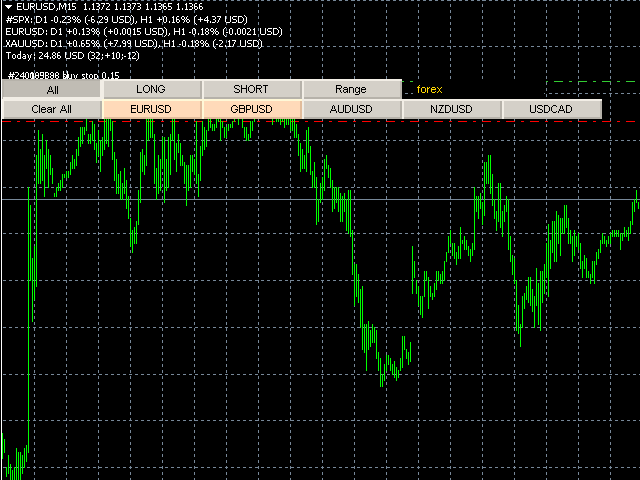 The code we have written so far works equally well in both MQL5 and MQL4. This is not the case with the functions that save and restore graphical objects. In MQL4, the graphical object type and its separate properties are described by constants of numeric type, while MQL5 applies enumerations (enum type) for that. This is why it is quite difficult to save them to a file and restore them. At least I could not cope with this task in a general sense. The functionality of saving graphical objects for MQL4 is of greater help to us here. Theoretically, it can save any graphical object (I have not tested it with all objects, so exceptions are possible). The MQL5 functionality allows it working only with horizontal lines, labels and text fields. If you need to save other graphical objects, you have to implement it on your own. As you can see, we do not retain all the properties of the object, but only OBJPROP_COLOR, OBJPROP_STYLE, OBJPROP_WIDTH, OBJPROP_TIME, OBJPROP_TIMEFRAMES, OBJPROP_ANCHOR, OBJPROP_XDISTANCE, OBJPROP_YDISTANCE, OBJPROP_STATE, OBJPROP_XSIZE, OBJPROP_YSIZE, OBJPROP_XOFFSET, OBJPROP_YOFFSET, OBJPROP_BGCOLOR, OBJPROP_BORDER_COLOR, OBJPROP_PRICE and OBJPROP_TEXT. If any of the applied graphical objects is saved incorrectly while working with the utility, this means not all applied properties have been saved. In this case, simply add saving missing properties to this function, so that this type of graphical objects is supported as well. If we take a closer look, we will notice that we have to use a separate string for creating an object for objects of different types, whereas in MQL4, one string is enough for all objects. This is also the case with object properties. In MQL4, we used one property creation string per its type (string, real or integer). In MQL5, every property requires a separate string of its creation. Applying the functions. Now let's add calling the functions to the appropriate parts of the program. The call of the loadchart function is added inside the showcharts function, which opens the chart in accordance with the button we have pressed. The call of the chart saving function is to be added to the blocks of code related to responding to pressing the chart navigation buttons: Next chart, Prev chart and Close chart, as well as the buttons for adding/removing a symbol from the homework tabs. In the previous article, we mentioned that the symbol list for filtration can be taken not only from the list of symbols offered by the broker, but also from an input. First, this allows displaying only the limited set of symbols in the necessary order. Second, the custom set of symbols can be used to perform preliminary filtration on the finviz.com or a similar website. In the previous article, we formed a set of several inputs allowing users to sort symbols by price, ATR, etc. However, these features pale in comparison to the finviz.com website screener. Most importantly, MQL4 features no possibility to sort symbols by a real volume, while in many strategies based on trading levels, this is a very important indicator. The finviz.com website allows you to sort by the stock's average volume, as well as the volume traded within the current day. We need the onlySymbolsPrefix and onlySymbolsSuffix parameters if names of symbols offered by your broker are different from official tickers. Some brokers add the .us suffix for US stocks and the .eu suffix for European stocks, while some brokers add the m suffix to any tickers. Brokers may also add # at the beginning of stock tickers. Adding the ability to import symbols from a file. Looking ahead, I will say right away that we are going to have an issue with importing symbols from the input. This issue concerns the maximum string length. While using the input, we are limited to 15-20 tickers at most. Therefore, the input can be used only to limit working instruments by a small number of symbols. Therefore, in addition to the input, you may also place the necessary symbols to the symbols.txt file created in the Files folder. Implementation in the code. Let's divide the process of forming the list of symbols for the All tab into two blocks. Forming a symbol list using the finviz.com screener. Finally, let's take a look at how to import tickers selected on finviz.com to our utility. All is simple. After the sorting, go to the Tickers tab on the screener page. You will see the cloud consisting of selected tickers' names. Select them all, copy and paste either to the symbols.txt file, or to the input. If there are several pages containing sorting results, go to the next page and do the same.